The U.S. president said Putin is less of a problem than under-spending NATO allies. U.S. President Donald Trump speaks with the news media before boarding Marine One for travel to Europe from the White House, in Washington, U.S., July 10, 2018. President Donald Trump's NATO allies will have little time for his pro-Russian musings when he meets the alliance's leaders at their annual summit in Brussels starting Wednesday, says Prime Minister Justin Trudeau. Trudeau delivered that message during a day-long visit to Latvia ahead of the 29-country military summit, and just hours after Trump moved to disrupt the meeting by casting Russia in a positive light. Prior to his departure for Brussels, Trump raised eyebrows when he said that of all the items on his travel itinerary, Russian President Vladimir Putin likely poses less of a problem for him than his miserly NATO allies or the European Union's pending Brexit breakup with Britain. 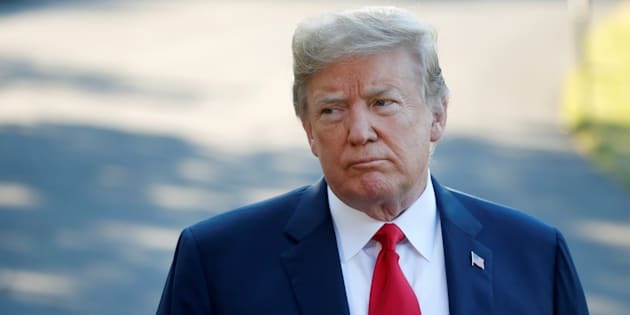 Trump also heaped praise on former British foreign secretary Boris Johnson, who led Britain's "leave'' campaign during its 2016 Brexit referendum, and whose resignation this week has triggered a political crisis for Britain's Conservative government. Britain's summer 2016 referendum saw the leave side prevail by a 52-48 margin — a populist victory combined with Trump's surprise victory in the U.S. presidential race later in the year that sparked upheaval in the global order. Trudeau made it clear that he will join his fellow NATO allies in the defending an alliance originally built to counter the former Soviet Union, following the Second World War. "The meeting tomorrow will be an opportunity for all of our countries to rededicate ourselves to NATO, to demonstrate that it's actually important, that it actually does important things, and that the collection of values and rules that it was brought in to defend 75-plus years ago are just as relevant today as they ever were,'' Trudeau said. U.S. President Donald Trump meets with Russian President Vladimir Putin during their bilateral meeting at the G20 summit in Hamburg, Germany on July 7, 2017. Trump is to meet Putin in Helsinki next week in a summit that has generated much unease. Special counsel Robert Mueller is investigating potential co-ordination between Russia and Trump's Republican presidential campaign. The U.S. president is also threatening to disrupt the NATO summit by minimizing the negative influence of Russia — a repeat of his tactic before last month's G7 summit, when he called for Russia's reinstatement in the group. "So I have NATO, I have the U.K., which is in somewhat turmoil, and I have Putin. Frankly, Putin may be the easiest of them all. Who would think? Who would think?'' the president said outside the White House before his departure. Trump travels to London later in the week and will get a first-hand view of the political turmoil currently engulfing the government of Prime Minister Theresa May over her government's Brexit plan. May is dealing with the aftermath of departure of some Brexit hardliners from her cabinet because they object to her approach. Most notable is the departure of Johnson, who was one of the primary drivers of the campaign for Britain to leave the EU. Trump has praised Brexiteers and trashed the EU in the past, and he piled on ahead of his first visit to Britain. Leo, one of the creators gives the six metre high inflatable TrumpBaby at his first London outing inside the disused North London playground in Islington, London on June 26, 2018. Trump's comments are "frightful'' even if he has a point about some NATO countries not spending enough on defence, including Canada, said Brett Boudreau, a retired Canadian Forces colonel now based in London and who was formerly posted to NATO headquarters in Brussels. "Disparaging long-standing allies at the same time as talking up the country that has wantonly seized territory and redrawn Europe's borders by military force for the first time since World War Two is disconcerting to say the least,'' said Boudreau. Trump is unpopular in Britain, so supporting Johnson could help May, and sow doubt about Britain's decision to part ways with the EU, he added. Canada and Britain will eventually start their own free trade talks if and when the Brexit divorce is finalized, but until then the Canada-EU free trade deal remains in force. Both countries will be well-served in the meantime by the British parliament's recent decision to ratify the deal, known as CETA, said Joseph Pickerill, a spokesman for International Trade Minister Francois-Philippe Champagne.